Director/Producer – Tarsem, Screenplay – Dan Gilroy, Nico Soultanakis & Tarsem, Based on the Film Yo Ho Ho Written by Valeri Petrov, Photography (colour + one scene b&w) – Colin Watkinson, Music – Krishna Levy, Visual Effects Supervisors – Alain Carsoux & Tom Sparks, Visual Effects – Duboi, Dream Sequence Animation – Christoph Launstein & Wolfgang Launstein, Models & Effects Supervisor – Adam Howarth, Production Design – Ged Clarke. Production Company – Googly Films. California, around 1920. Alexandria, a young Rumanian immigrant child, is in hospital with a broken arm after falling while picking oranges. She befriends Roy Walker, a movie actor who has broken his legs in a fall after trying to kill himself because the woman he loved left with another actor. Roy begins telling Alexandria stories. He tells her an epic tale that concerns five men abandoned on a reef by the Spanish governor Odious – Otta Benga, a slave who escaped his chains; an Indian whose beloved bride was abducted by Odious; the Italian explosives expert Luigi who was ostracised in his home town because of Odious; the naturalist Charles Darwin and his monkey companion Wallace; and a masked bandit who swears an oath against Odious for the murder of his brother. They make an escape from the reef by grabbing onto an elephant that floats past. On land, a mystic joins them, offering guidance. After raiding a caravan, the bandit abducts the beautiful Sister Evelyn and they fall in love, only for him to learn that she is Odious’s fiancee. During the telling of the story, Roy tries to wind events around in order to get Alexandria to steal the drugs from the infirmary that he needs to complete his suicide. The Indian-born Tarsem Singh, known on screen variously as Tarsem or Tarsem Singh Dhandwar, is a fascinating directorial talent. The bulk of Tarsem’s work has been in commercials and music video where he gained a considerable reputation during the 1990s. Tarsem made a striking debut on cinema screens with his first film, the Jennifer Lopez starring The Cell (2000) where he appropriated the look of various modernist works of art to depict the visually ornate interior world of a madman. Subsequent to that, Tarsem was associated as director of a number of other projects, including the long planned remakes of Westworld (1973) and Logan’s Run (1976), as well as Constantine (2005) but chose instead to make The Fall..
Tarsem’s second and clearly his most personal film was The Fall. It is a work that he planned for nearly a decade-and-a-half and mostly financed out of his own pocket. 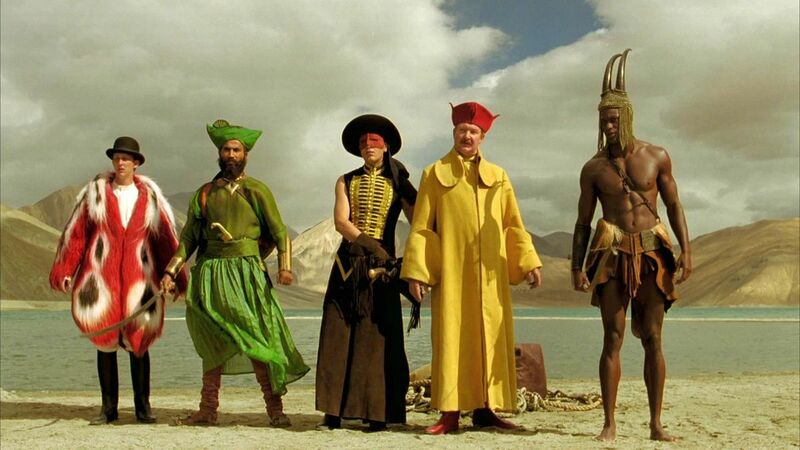 Tarsem filmed The Fall around the world in eighteen different countries, ranging from India to China, Turkey, Fiji, Indonesia, the Czech Republic, Argentina, Bolivia, Namibia and Nepal, while all the California hospital scenes were shot in South Africa. Shooting took place over a four-year period between 2002 and 2005 with the finished film premiering at the Toronto International Film Festival in 2006. Even then, distributors were perplexed at how to sell the film and it only achieved limited arthouse distribution in 2008. Tarsem’s films have a visual look quite unlike any other director. 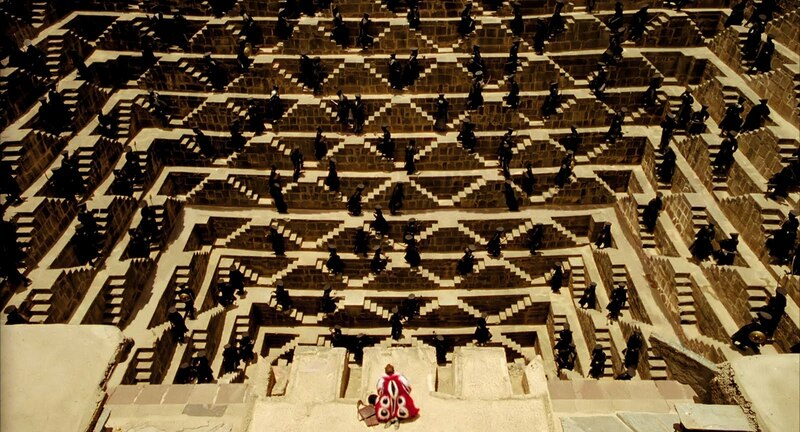 In a more routine commercial director’s hands, the story here might emerge as slight, but under Tarsem’s control the entire film is driven by the beauty and extravagance of the visuals. It is one of the rare examples of film functioning the way a painting in a gallery does (as opposed to a medium driven by a dramatic story). This is more than evident from the opening tableau in black-and-white with a train stopped on a bridge – what is happening is not fully clear but seems to involve the winching of a horse up out of the water. Tarsem shoots the entire sequence in slow-motion, focusing in hyper-realised detail on the faces emerging from the water, the rope slowly snaking down as it is tossed over the side, or beautiful shots panning around the onlookers stilled in motion as they look over the rail, and with everything to the accompaniment of Beethoven’s Seventh Symphony. The entire scene almost feels like the three-dimensional replication of a still-life tableau from one of the American Realists such as George Bellows or Edward Hopper. The film almost entirely exists as a gallery of extraordinary images. These include the likes of Alexander and his soldiers meeting as tiny figures in the midst of a desert where they are dwarfed by the landscape behind them, a single vast wall of orange sand; the Indian’s wife trapped inside a maze (the Jantar Mantar labyrinth in Jaipur) and fleeing to a tower from which she plunges to her death; the flight from an arroyo of desert canyons into a series of richly verdant green terraces that suddenly erupt into hundreds of the mystic’s people; the appearance of hundreds of black-garbed soldiers from the terraced sides of a stepwell; slaves struggling across a desert pulling a giant red carriage where several of them are chained inside the giant wooden wheels forced to turn them like hamsters; elephants swimming through the ocean; a city (Jodhpur in India) where the houses below are all painted blue; a wedding that takes place surrounded by twirling dervishes. Even amazing little scenes where Sister Evelyn confesses her feelings for the bandit and all her dialogue is followed by a child’s voice in aria in the background singing the words that she has just said. Mostly, the film dazzles with Tarsem’s ability to shoot landscapes and to a lesser extent dramatic confrontations with an extraordinary artist’s eye that makes them seem unlike anything you have ever seen before. This is a film made for the pure love of the visuals and beauty of the art in itself. 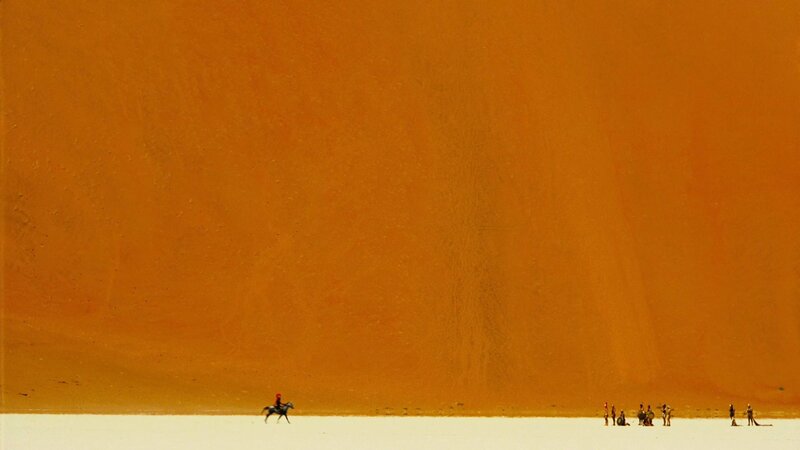 The point that should be noted about The Fall is that Tarsem refused to use visual effects to create the landscapes and that everything in the film makes use of existing locations in the real world. The result is something far more fantastical than could ever have been achieved artificially. The Da Vinci Code (2003) apparently inspired tours of the real locations mentioned in the book and The Fall is a film where, were it more well known, you could imagine the equivalent or at the very least some accompanying travelogue documentary to show more about the places used as locations. Tarsem took his inspiration from another film, the little-known Bulgarian-made Yo Ho Ho (1981) about a boy in a hospital who is befriended by an actor who tells a fanciful story about pirates but where beneath this lies the actor’s desire to get the boy to procure the drugs he needs to kill himself. Some critics made comparisons to The Princess Bride (1987), a similar swashbuckling adventure that is being told to a young boy by his grandfather. A far greater number of similarities lie with the great Dennis Potter tv mini-series The Singing Detective (1986) – both feature a bedridden man who starts to tell a story (a detective story in The Singing Detective, a swashbuckling adventure in The Fall) where it becomes apparent that the teller has wound figures around the hospital and their own life into the telling (with actors doubling over in two roles) and where the story being narrated comes to echo basic truths that the narrator needs to confront in the real world. There also gets to be a third version of events told near the end where we see a silent movie in which many of the principals play out similar roles. Certainly, The Singing Detective conducts a stunningly layered meta-fiction out of the idea, against which The Fall is somewhat the lesser. Nevertheless, Tarsem conducts his version with a more than reasonable degree of cleverness and sophistication. The film also captures the sense of period (1910s-20s) in terms of the exquisite detail of the hospital, the clothing and set dressings far better than almost any other period film set around this time manages. The costumery is stunning with amazingly ornate pieces – like Justine Waddell’s appearance in a headdress that seems like a lily bud and a mask that consists of two fans like blinds across her eyes, of wedding gowns that look like some of Princess Amidala’s outfits from Star Wars Episode I: The Phantom Menace (1999), or of Odious’s soldiers in black head-to-toe black uniforms with helmets that look like Ned Kelly’s mask redesigned into sleek salmon-like figures, even Leo Bill who goes through the film in a fur coat painted with coloured whorls that make him seem like the butterfly he quests for. One of Tarsem’s weaknesses in The Cell was a focus on visuals at the expense of characters who seemed indifferent and forgettable. He has clearly learned from this by the time of The Fall. Here, Tarsem has chosen to go with a largely unknown cast. The only recognisable name is Lee Pace who has an undeniable screen charisma as the suicidal storyteller. The great find of the show is seven-year-old Rumanian child actress Catinca Untaru. Catinca has a seemingly effortless natural ability and slots into her part with complete ease and none of the posed affect that you get with Hollywood child stars. Subsequent to The Fall, Tarsem Singh made the Greek myth adventure Immortals (2011), the Snow White adaptation Mirror Mirror (2012), the bodyswap film Self/less (2015) and the reworked Wizard of Oz tv series Emerald City (2017). (Winner in this site’s Top 10 Films of 2006 list. Winner for Best Director (Tarsem) and Best Cinematography at this site’s Best of 2006 Awards).